Welcome to the website for Amateur Radio Station AC2C located in Ellicott City, Maryland. Please note that each image on this page is linked to a larger, high-resolution, image. Smaller images are displayed here to enable faster loading. Clicking on any image will result in a high-resolution image opening in a separate browser window. A Vibroplex Anniversary semi-automatic "bug"
The Vibroplex "bug" has extra weights to set it's speed at about 18 words per minute (wpm). The SKCC 2014 Key and bug are used for slower speed and ALL SKCC QSOs and the iambic paddles and keyer are used for higher speeds and contesting. Use the navigation buttons on the left panel to go directly to a specific page of interest or step through each page sequentially by following the link at the bottom of each page. 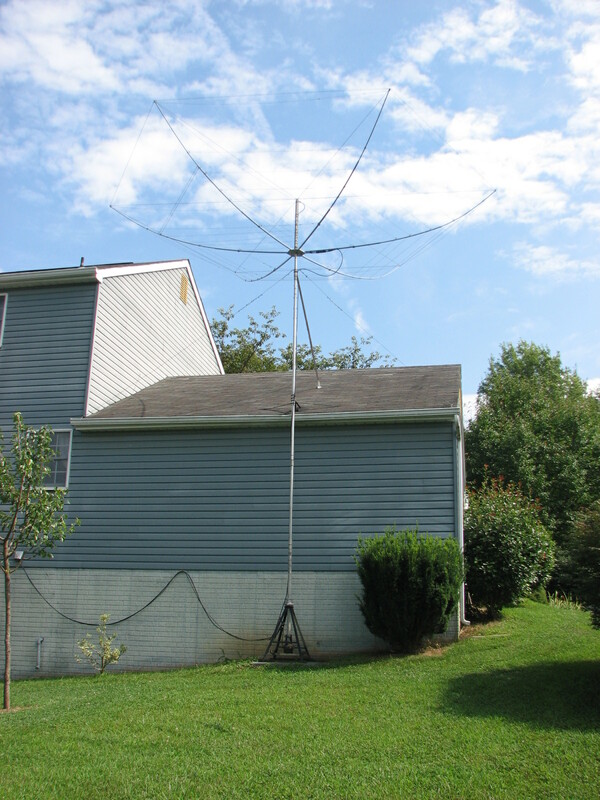 The photo on the left shows a K4KIO Hex Beam which is my main antenna and is the most visible external evidence of a Ham Radio Station at the residence. 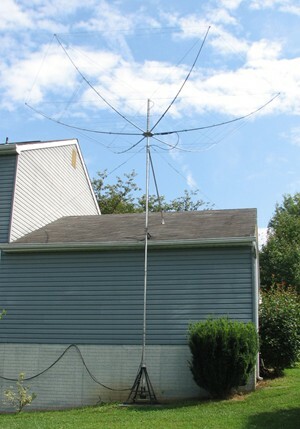 The Hex-Beam antenna contains 6 sets of wires providing a two-element directional antenna covering the 20M, 17M, 15M, 12M, 10M, and 6M Amateur Radio Bands. The photo on the right is me operating in the 2013 ARRL Field Day event. 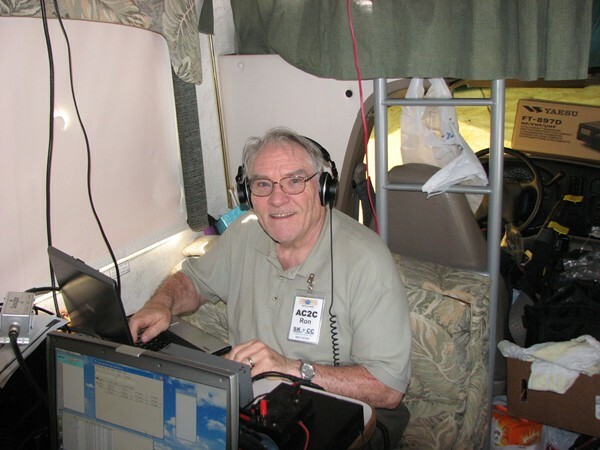 I am operating inside an RV owned by Ray (KC3RW) and Kerry (KB3WAV) Wright. We were operating as K3PZN, Class 8A, from the Gamber Volunteer Fire Department Carnival Grounds in Gamber, Maryland. 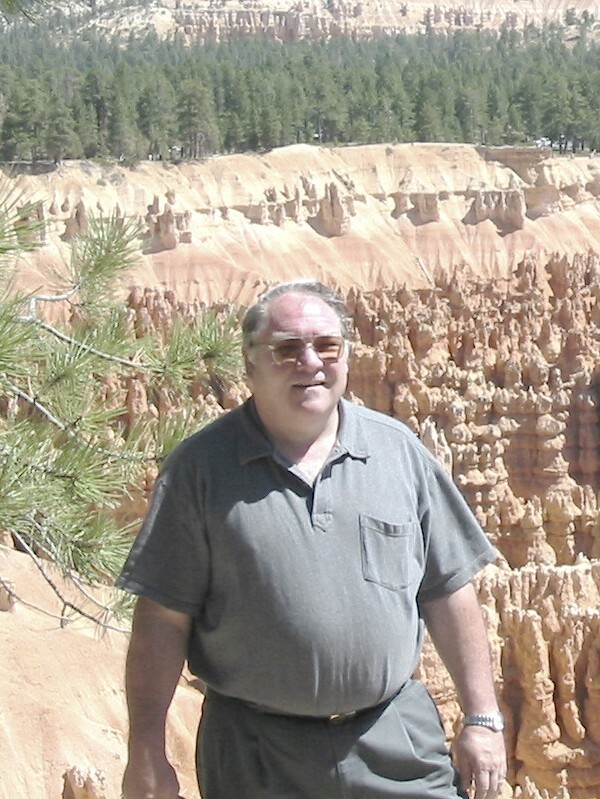 I have built this web site to be viewed by both Hams and non-Hams. While some areas may get a bit technical and contain information and lingo specific to Ham Radio Operators, I have tried to avoid use of hobby-specific lingo in areas that may be of general interest. 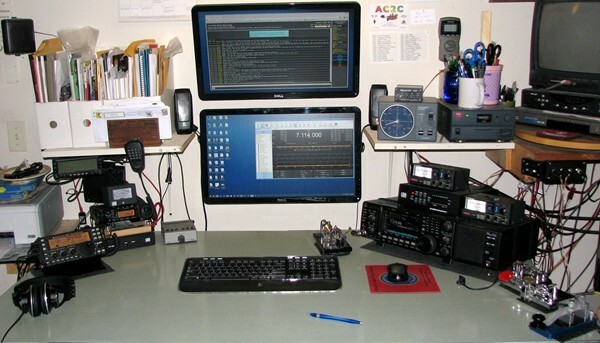 Although I have spent some time checking out various operating modes such as SSB, PSK-31, FM, Slow-Scan Television and RTTY, my primary operating mode remains plain old Morse code - or what we Hams usually call CW (or Continuous Wave). My interest in and enthusiasm for advancing and preserving the use of Morse Code as a communications mode is evidenced by my active membership in the SKCC, FISTS, and NAQCC clubs. I am most active with the SKCC (Straight Key Centurty Club) and currently serve as the club's Centurion and Tribune Award Administrator. I also served the club as the coordinator for the 2009 and 2010 K3Y events which were month-long events celebrating the third and fourth year anniversary of the club. My volunteer efforts in support of the SKCC have earned me recognition as a member of the SKCC Hall of Fame and the SKCC Honor Roll. Contrary to the opinion of some members of the family, who shall remain nameless, I actually do frequently escape from the radio room and enjoy other activities. My wife and I enjoy taking road trips - some of which involve rather lengthy drives. We really like National Parks and we try to visit, on average, at least one different National Park per year and still have many yet to go. I don't think we'll run out for a while. 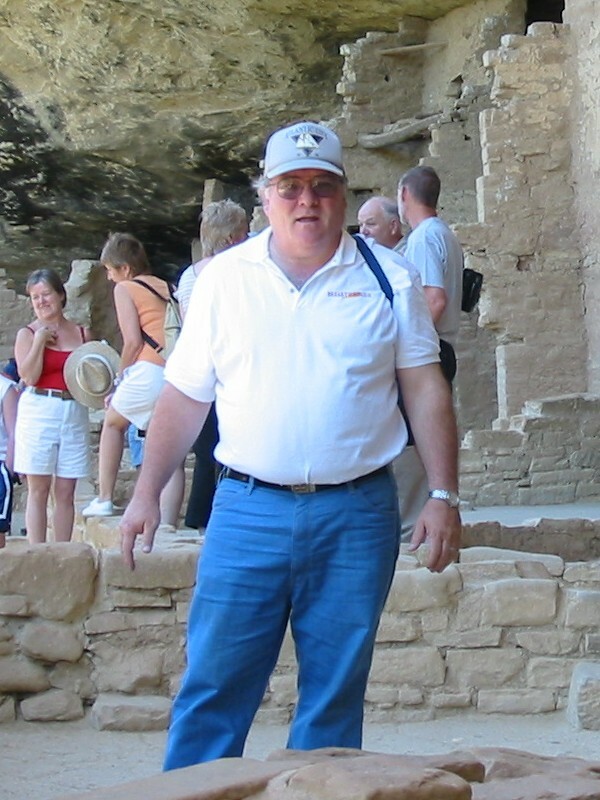 Shown here are some pictures of me, AC2C, taken at Mesa Verde National Park, Yellowstone National Park, and Bryce Canyon National Park. In 2002 and 2003 we took two separate trips to visit some Western National Parks - Both trips started in Las Vegas. The 2002 trip included visiting Las Vegas, we then visited the Mormon Temple, and then continued on to Yellowstone National Park. After a few days in Yellowstone N.P., we drove through the Grand Tetons and then went to Canyonlands National Park and Arches National Park in North East Utah. The 2002 Western National Park trip ended with visits to Bryce Canyon National Park and Zion National Park in South West Utah. The 2003 trip again started out in Las Vegas, but involved a few days of driving to finally reach Devils Tower National Monument in Wyoming. Following Devils Tower, we continued on to Mt. Rushmore National Memorial and the Crazy Horse Memorial in South West South Dakota. 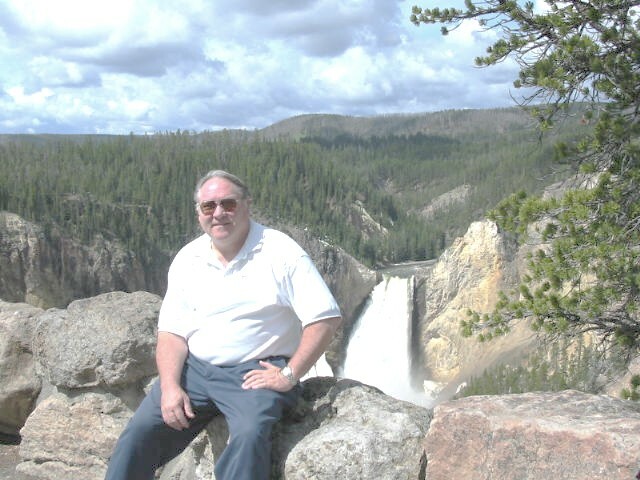 The trip then included a few days in Rocky Mountain National Park before going on to Mesa Verde National Park in South West Colorado and ended at the Grand Canyon before returning to Las Vegas for the flight home. Besides visiting National Parks and Monuments, we also enjoy taking a trip each fall to enjoy and photograph fall foliage. Most of our foliage hunting trips involve areas in the North East U.S.